Prep. Images is a simple application to help prepare photographs for publishing on the web. One at a time, images are displayed so that you can place (via mouse or keyboard) and add a copyright image in one of the corners. Images can also be resized (and sharpened), if required. Prep. Images is written in Python. Prep. Images is free/libre open-source software, available under the terms of the GNU General Public License version 3 or later. You may need to be root to run the final command. You can also run it from the command-line. prep-images expects a list of image files passed as program arguments. 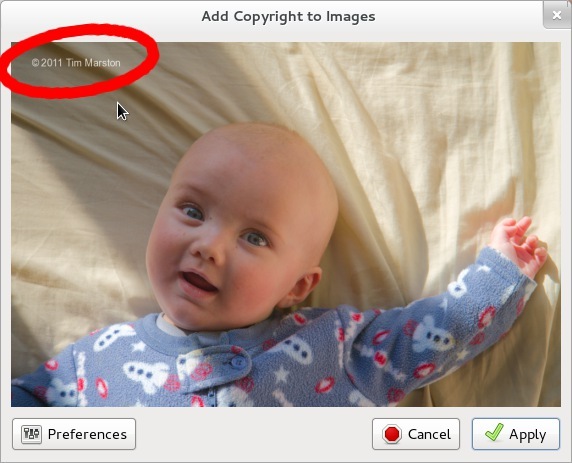 Select the copyright image that you want to overlay on your photographs. Typically, this might be a PNG with a transparent background that contains a copyright message. If enabled, the image will also be resized as the copyright image is applied. You will also need to specify a maximum width and height to resize the image to. A small amount of sharpening is also performed after resizing. append “.publish” (or some other tezt) to the filename and save to a new file, leaving the original unmodified. When you first run Prep. Images, you will need to set up the program’s preferences. 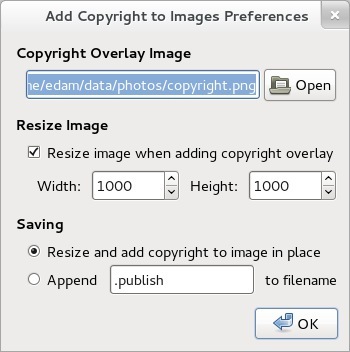 Until you do, you will not be able to overlay a copyright image. The image is immediately altered (or a new image is saved), as per your preferences. You can always drop me an email. Feedback and suggestions are always welcome.